I am, but I'd be more excited with a free plush horse. There's a couple of Harvest Moon fans on the Nintendo Life team in Europe, now staring enviously at their counterparts across the pond as the latest plush toy preorder giveaway has been revealed for the upcoming Harvest Moon: Grand Bazaar. If you preorder the title at GameStop you'll receive a lovely horse toy as a memento of your latest attempt to turn a worthless scrap of land into a huge money-making farming enterprise. Harvest Moon: Grand Bazaar is expected to launch in North America in July. A horse sounds pretty neat, but I promised myself I would never buy another Harvest Moon game without looking at reviews first. Nope, no buy for me. NOT EVEN ONE! Harvest Moon is nice but not for a pre-order ! 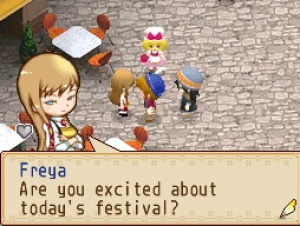 "Are you excited about today's festival?" "I am, but I'd be more excited with a free plush horse." Oh James, you crack me up. I love Harvest Moon. been waiting for this. Harvest Moon games are awesome but ill wait to get this. I love HM and I want the toy and I liked the wii ones but I was disappointed with the ones for DS.